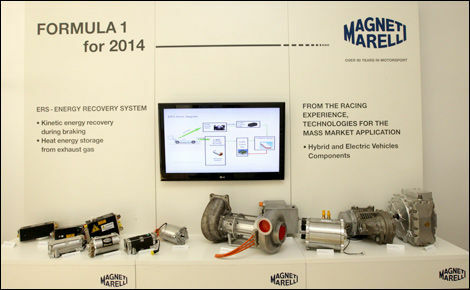 Italian electronic company Magneti Marelli used the paddock of Autodromo di Monza last weekend to reveal some of their new hardware destined to run the new 1600cm3, V6 turbo engines in 2014. Magneti Marelli engineers started by showing their new ERS system -- an engine boost coming from the recovery of kinetic energy during braking associated with the energy coming from exhaust gases, both aimed at feeding the electrical motor-generators hooked up to the engine shaft). 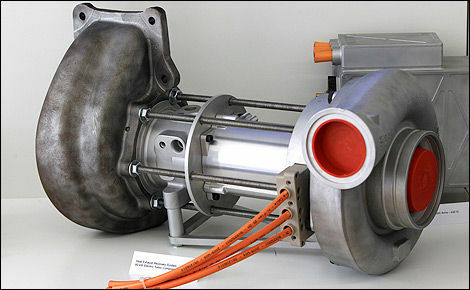 Then, they unviled their new fuel systems (injectors and pumps for GDI engines with fuel pressure of up to 500 bar) as well as their two-way WI-FI systems for data transmission from vehicle to infrastructure (i.e., exchange of a much larger set of data and of different types of signals between machine and pit). 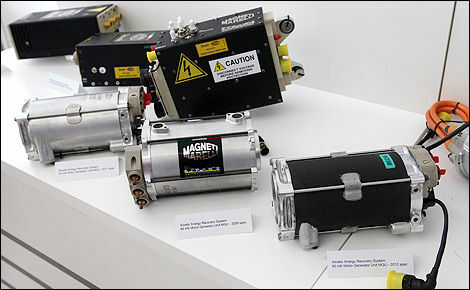 In their press release, Magneti Marelli writes that the technology and methods used in developing the KERS system are a source of solutions and technological spin-offs for systems and components aimed at mass-produced hybrid and electric engines (moto-generators, electronic control systems, inverters, battery control, etc.). Formula 1 teams will travel to Italy this weekend to contest the famed Italian Grand Prix held on the toughest circuit of the season on engines. Lewis Hamilton got off the line slowly at the start of the Italian Grand Prix, but came back strong to win the race. Mercedes driver Lewis Hamilton enjoyed a rare trouble-free qualifying session, Saturday in Monza. He will head the grid, Sunday ahead of the Italian Grand Prix.